Logan Langly is about to turn thirteen, an important age in this dystopian future. At thirteen, he is eligible to Pledge and receive “the Mark” that enables him to shop at a store, have a job, visit a doctor, and be a citizen. But Logan is afraid. His sister never returned from the Center on her thirteenth birthday and now he thinks someone is watching him. 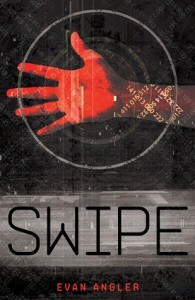 Swipe is a solid piece of middle grade dystopian fiction. Though it starts out a bit slow, the pace picks up and the suspense grows to a satisfying conclusion while leaving a lot of room for action in the sequels. 4/5 stars. Recommended for readers thirteen and up who enjoy a suspenseful dystopian story set in a very plausible future. A good start to what should be an interesting series. Some worrying acts of violence but clean language. I am looking forward to continuing Evan Angler’s The Swipe Series with Sneak, Storm and Spark, and to sharing them with my thirteen year old nephew. I purchased this book from Book Outlet. Swipe was authored by Evan Angler and published by Thomas Nelson, Inc. in 2011.